Doug Baldwin didn't do much in Seattle's 33-31 defeat to the Rams, but David Moore and Tyler Lockett stepped up to fill the void. "They’ve been savages, they’ve been beasts," Baldwin says. 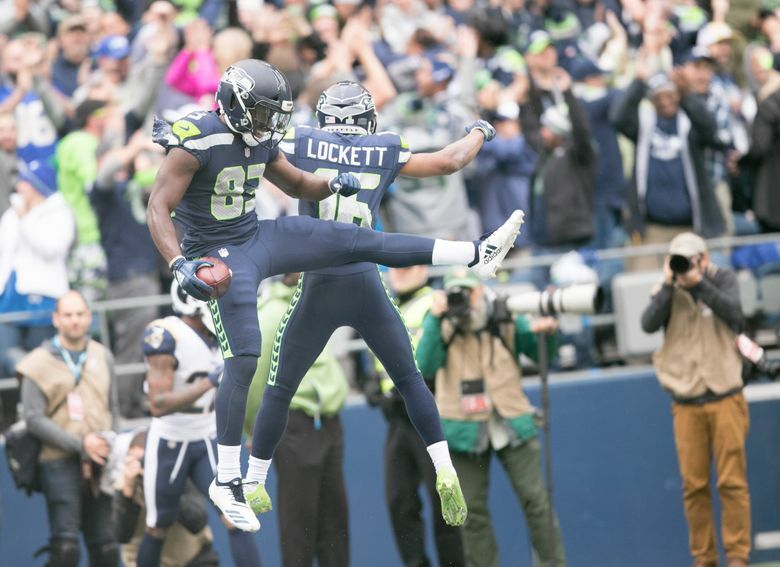 Doug Baldwin didn’t lack for a description of what he saw from fellow receivers Tyler Lockett and David Moore on Sunday after they combined for six catches for 136 yards and two touchdowns. Baldwin was at more of a loss for words when it came to his own day in Seattle’s 33-31 loss to the Rams, Baldwin had just one catch for one yard on one target, one of only two times since the 2013 season he has had just one catch in a game in which he played the entire way. The game was just Baldwin’s second after returning from a sprained right MCL suffered in the opener against Denver. Last week’s Cardinals’ game was his first game back after sitting out the preseason to deal with a chronic issue to his left knee. The knees are undoubtedly still bothering him — Baldwin said in the preseason he would have to manage his left knee all season. The bye week following next Sunday’s game against the Raiders in London appears to be arriving at a good time for him. That Baldwin may still need some time to get going made it imperative that the Seahawks get more out of Moore and Lockett. And on Sunday each responded. Lockett had a 39-yard TD on a play-action pass in the second quarter, beating former UW star Marcus Peters in the process. He also had a 44-yarder in the fourth quarter that appeared to have the Seahawks in position for a potential game-winning field goal before penalties moved the Seahawks back. Moore, a second-year player, scored the first two touchdowns of his career — he carried the balls out of the locker room with him after the game — on a day when it became clear he has moved ahead of veteran Brandon Marshall in the team’s receiver rotation. Moore had a 3-yard touchdown in the third quarter on a play when the officials reviewed to see if he had stepped out of the back of the end zone as he ran from left to right while Russell Wilson scrambled out of pressure. He then caught a 30-yarder later in the same quarter on another perfectly executed play-action throw. The Seahawks had lamented not getting enough out of their play-action game last week in a 20-17 win at Arizona and made it a priority against the Rams. “That was what we wanted to do with the offense this week and we got it done,’’ said Moore. Moore also said catching his first two TDs along with a career-high three receptions “builds confidence’’ that he belongs at this level. “David Moore had a great game,’’ said Wilson of Moore, who had made the first two catches of his career last week against Arizona. “I was really excited for him and all the work that he’s put in,” Wilson said. Lockett, meanwhile, only further enhanced the idea that for now, he is the team’s number one receiving option — he has a team-high 20 receptions for 347 yards and a 17.4 yard average along with four touchdowns. Baldwin has six catches for 42 yards and yet to find the end zone this season. Asked afterward if the Seahawks can take positives in the offensive performance Sunday, Baldwin nodded. “Sure, you can do that,’’ he said, undoubtedly hoping that one day soon, he’ll be part of the reason for the optimism.